Ever since a Roman took a look at a hairy tribesman and thought ‘I’m not going out like that’, shaving has been a mainstay of Western male grooming habits for nearly 2000 years. Admittedly, there’s been the odd blip, such as the Vikings, or those fantastically moustachioed men of the 1800s, but, by and large, smooth-skinned cheeks have been the norm. With the slow demise of the professional shave by a high street barbers and the rise of the handheld razor as championed by Gillette/Wilkinson Sword/Bic/etc, companies that produce shaving products have merrily marketed themselves as the “Mans’ Choice”, and often featured sports stars of varying fame and the occasional scantily-clad lady in a shameless appeal to the machismo and testosterone that surrounds the whole idea of running very sharp blades of steel over your face and throat. However, with the emergence of Organic Products, and the whole Green lobby, these companies have found themselves in a bit of a quandary. Mainstream Male aversion to ‘metrosexuality’ is still fairly strong, but it’s tempered by a growing eco-awareness, which begs the question: HOW can we market these products without diluting the aura of “manliness” that surrounds shaving? In Bulldog’s case, their Eco-System Shave Gel has an obvious difference to their normal range. It’s green. Not just any old green, but olive drab, which immediately put me in mind of army colours. Soooo…an interesting start. 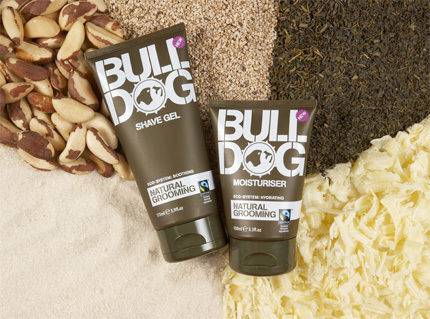 Then, looking over the tube, there’s a prominent label of ‘Natural Grooming’. 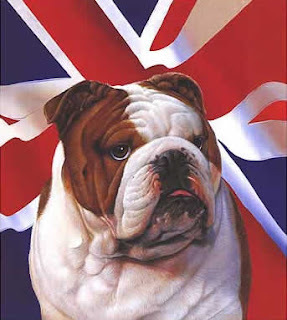 Ok…Bulldog….Natural Grooming…ok, that’s a BAD image in my book. Moving on. I had a bit more of a look at the packaging, and came across a little homily about Dad saying how “Nothing in life is fair, son”…which left me sighing, to be honest. The whole thing just SCREAMS mixed message…I just thought they were trying too hard! The Gel itself is aromatic. Very aromatic. It reeks of herbs and green tea, and it’s not really the nicest smell to rub into your face first thing in the morning. That said, it lathers up nicely, and yes, your skin feels smooth & doesn’t sting at all as you shave. Which is nice. So, functionally, it works, quite well. I love Mr Lippie's reviews. And thanks to his cogent thoughts, I don't think I'll be persuading Mr S from the King of Shaves just yet. Ahhh its good to hear from the boy's side of the fence. Your description of the smell actually swung it for me. Going to get some! Loving the style of the review. Such a shame that we didn't win you over this time. Definitely try the Original Range though and let us know what you think. All the feedback, good and bad, gets put into the mixer when we are making changes to existing products and coming up with new ones.